Moving Amsterdam style is a unique experience: boxes, suitcases and furniture go out the window, where they are maneuvered with the aid of a thick rope and a pull-levy, instead of the stairs or an elevator. Many buildings are 50+ years old, and few equipped with an elevator – but all of them have a hook to help you get your couch or refrigerator inside. Even with an elevator, moving is a burden; without it, a nightmare. Nevertheless, once your furniture is on the street corner, comes the next challenge. Few people own (large) cars for moving and with distances close enough to justify a bicycle… it is a viable option. 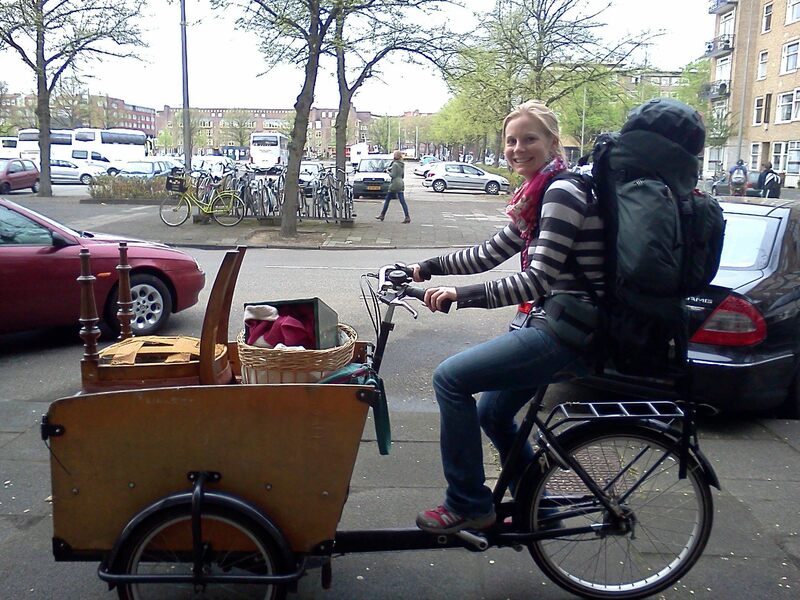 Renting a cargo bike (bakfiets) for a day costs 25 EUR (opposed to at 100 EUR for a small car, and finding parking to haul your furniture from the parking space to the apartment). A bakfiets is not your average bicycle; they often have 3 wheels and are large enough to rival a pick-up truck for storage space. They are not easy to maneuver and even harder to break, but once you get a handle on how they operate, they are not too difficult. For the first time around, when moving with friends, we got the full-sized (think back of a pick up truck) version. Slow & steady, but it got the job done in 3 rounds. The next time when I did it on my own during a work day, I opted for a more family-friendly version (child 3-seater). Of course, I would have been lost without friends that arrived that evening (with a car) to move the final (heavier) pieces. However, I am happy to say I not only survived my move(s); but thrived using these monster bicycles. 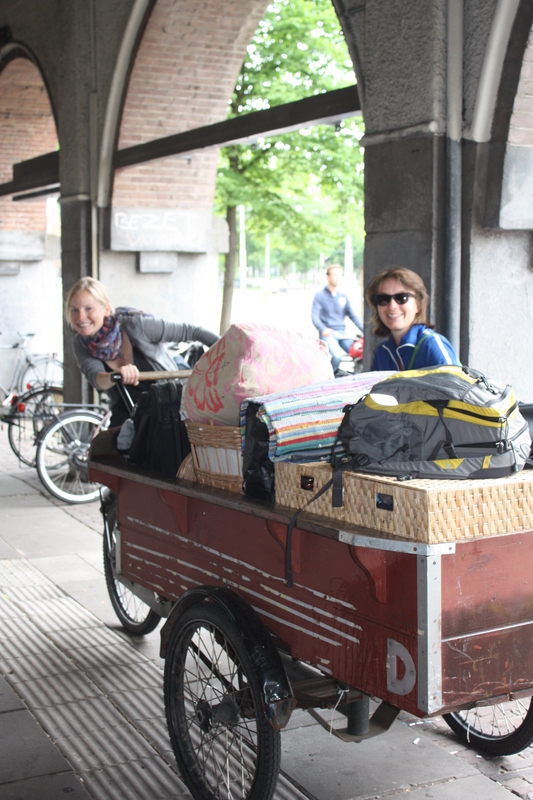 Moving often requires more than a bicycle and not all of the bicycle-loving Dutch would go for this option as a first choice; but in my case, it simply was the more practical one. While at the end of the day I was exhausted beyond words, I learned not just to recognize these funny bicycles that slowly progress down the bike paths of Amsterdam, but how to use them. 🙂 Needless to say, I was happy the next day to hop on my shiny red bicycle – easier to bike and easier to break. Still, to anyone moving in and around Amsterdam, I recommend the bakfiets!